You might recently have spotted some tweets and blog posts about the #RediscoverHilton campaign. The brand is reaching out to bloggers and inviting them to experience their local Hilton hotel. A couple of weeks ago it was my turn, and a very grateful Mr Fluff and I set off for a welcome break in the Dublin Hilton. With more than 540 locations in 78 countries, understandably, not all Hiltons are created equal. 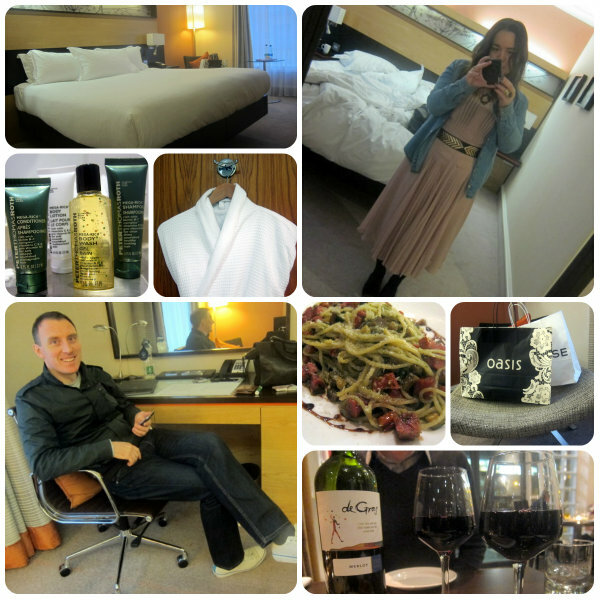 I almost booked my wedding in the very plush and high-end Hilton Malta, and have also spent a night in the more functional Hilton at Stansted airport. The Dublin Hilton falls somewhere in between. Set on Charlemont Place overlooking the Grand Canal, there’s a peaceful and tranquil vibe about the place, despite its central location. There’s not much in the way of hotel facilities, although there is a small gym and a really nice and spacious hotel bar and restaurant. Everything feels very modern and well kept; the décor is in contemporary neutral tones and there are nice little touches like the orchid pots on every table in the airy, comfortable lobby. As for our room, well, click on the video to see for yourself! Nice, isn’t it, and a nice size, too. The Peter Thomas Roth goodies in the bathroom went down well, as did the complimentary chocolates, fruit and selection of magazines. I checked in ahead of the Mr so made full use of these before he arrived - and even squeezed in a spot of shopping, too. Stephen’s Green is just two stops away on the LUAS (that’s the Dublin tram system, non-Irishers). We wholeheartedly enjoyed our stay and, as the icing on the cake, one of you lovely people can get to experience it too. I have a £100 Hilton voucher up for grabs which can be used at any Hilton in Ireland or the UK, over the next year. Just follow the simple steps in the widget below – and best of luck, everyone! Apologies - the widget is not displaying for some reason! I'm en route to work and will sort it as soon as I get there so please check back in about an hour! Ooh fingers crossed! Would love a cheeky night away somewhere with my Mr :) The Dublin hotel sounds lovely! Oooh looks like a lovely place, good luck everyone. Woah they give you fruit and chocolate in your room?! I honestly thought that only happened in movies!! I loved your instagrams of the visit Emma. Looks like you had a great time! Looks like a lovely hotel, great giveaway! right my name is in the hat! I used to work for Hilton and stayed here once myself. It's a great hotel - and the location is so perfect too. So central but not crazy-loud like other places in the city! great giveaway, the Dublin hotel would be right up our street! I would love this. Closer to work too so would be handy for a nice stopover on a friday night! My little sis stayed here last week and said the breakfast was amazing! It sounds lovely! Can't beat a good hotel when you are going away though. I'd love the chance for a weekend away! Recently stayed at two Hiltons in London-great stays! Travelling to Belfast for Bruce Springstein in the summer and considering the Hilton up there so the voucher would be GREAT!! Amazing giveaway! Saying as it's the hubby and I's 6th wedding anniversary this weekend and we're stony broke this would be just the ticket! Fantabulous prize ;) Fingers crossed. This looks like a great prize, I would love to win. Looks like you had a lovely stay! The hotel looks lovely Emma, what a nice treat! That dress in the top photo is gorgeous, Emma. Ask them to do this in the States! hahaha I would love to stay at the Hilton! Good luck to all that enter. Fabulous! Looks great, I like the Hilton in Nottingham, cool!